This photo is from my business trip to Tokyo last October. I accompanied a customer who had a special interest in learning about authentic Japanese sushi, so we arranged for one of our suppliers to take us to the tuna auction at Tsukiji on a Friday morning. We went to Daiwa Sushi for breakfast at 6:45. While it was decidedly some of the most delicious sushi I have ever eaten and most likely will ever eat, seeing all those massive fish put a damper on the morning for me. 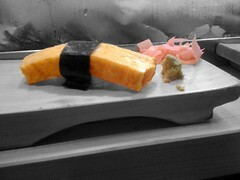 After gulping down a few bites of toro, I ordered a piece of tamago (egg), pictured.